So, we begin with the exposition of this marvelous book of prophecy! When I was a new believer in Christ, eschatology – or the prophetic study of “last things” – was an early favorite of mine. I consumed everything I could get a hold of by way of books, tapes and VHS tapes. It’s still a tremendous favorite of mine and quite to the contrary of the belief of some, prophecy IS our business and it IS VERY practical! And we are commanded by our LORD to “watch and pray” in regard to His Return (MARK 13:33; LUKE 21:36). We must and will resort to Scripture and careful observation of what the text actually says, and not what we may think it means. A close eye on the original Greek for many of these passages and words will be necessary as well as comparison with parallel texts found in the Old Testament and New. Just as the Holy Spirit inspired John to write this book, we likewise need the guidance of the Holy Spirit to understand it. I do believe however, that for most of this book, especially from Chapter 6 and onward, the fullness of understanding will be granted to those who will be living through this time, as they are the ones who will need it the most. For us, the church of Jesus Christ, His body, His bride, these latter chapters are in a sense, academic – holding to a ‘pre-tribulation’ view, we understand that the admonitions and warnings are not for us, but for those who will face this dreadful time under the reign of anti-Christ. The purpose for this time, known also as the Time of Jacob’s Trouble (JER 30:7) and Daniel’s 70th week (DAN 9:24) must be understood in order to determine who will be on the Earth to endure this period prior to the coming Prince of Peace; and we will get into that later when we examine the prayer of Daniel the prophet in DANIEL 9. Things past, "the things thou hast seen," i.e. the Patmos vision, REV 1:1-20. Things present, "the things which are," i.e. things then existing--obviously the churches. The temple had been destroyed, the Jews dispersed: the testimony of God had been committed to the Churches (1 TIM 3:15). Accordingly, we have seven messages to seven representative churches, REV 2:1-3:22. It is noteworthy that the church is not mentioned in chapters 5-18. Things future, "things which shall be hereafter," lit. "after these," i.e. after the church period ends, REV 4:1-REV 22:21. If you want to get to know someone, they will have to cooperate with your desire by revealing something of themselves. You can’t develop a relationship with someone if they’re tight-lipped, unwilling to reveal themselves and secretive. The LORD in His desire for us, His creatures, gave us this revelation with the intent of relationship. 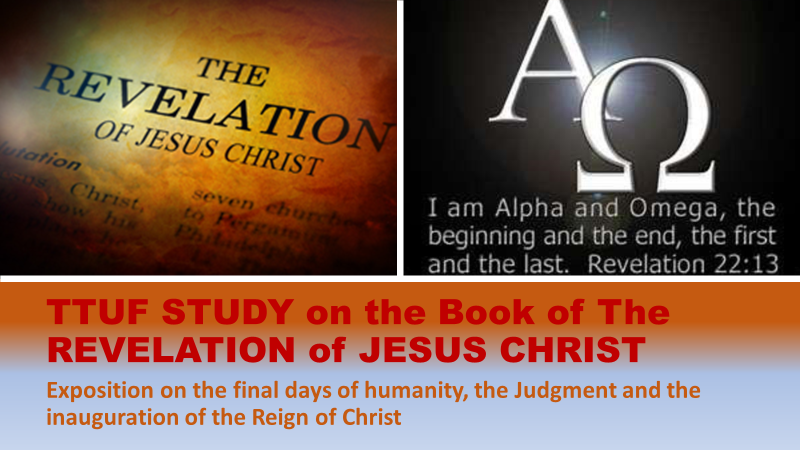 This revelation truly began in GENESIS and culminates with the fullness of glory in REVELATION (and note: This is not “the book of RevelationS” but Revelation – that is, the singular revelation and attention towards the glory of One: the LORD Jesus Christ. Yes, we have demon hordes, terrible judgments, horrifying visions and cataclysmic catastrophes galore, but the over-arching theme of this book is JESUS, the WORD of GOD, The KING of Kings and LORD of Lords! Notice Who is giving this revelation to Whom! “. . . which God gave unto Him . . .” for the express intent that the servants of the LORD would themselves be shown these things “which must shortly come to pass”. When then did the Father give this revelation to the Son? We know that the LORD showed these things to His servants – at the time when John was commanded to write these things. When did the LORD Jesus Christ receive this Himself? Some believe that it was after He ascended into heaven to be reunited with the Father and that very well may be; others believe it was at His baptism in the Jordan river by John the Baptist, when the Spirit like a dove descended upon Him (MATT 3:16; LUKE 4:18) and anointed Him in His official capacity as the Messiah of Israel. (1) "The Branch of Jehovah" (ISAIAH 4:2), that is, the "Immanuel" character of Christ ISAIAH 7:14 to be fully manifested to restored and converted Israel after His return in divine glory MATT 25:31. (3) Jehovah's "Servant, the Branch" ZECH 3:8; Messiah's humiliation and obedience unto death according to ISAIAH 52:13-15; 53:1-12; PHIL 2:5-8. Consider that “. . . the spirit of wisdom and understanding. . . the spirit of knowledge. . .” was given to the LORD Jesus “without measure” JOHN 3:34. For me, this strongly suggest that the Father granted His only begotten Son, this revelation at that time, but that the time for the Son to share it with His servants had not yet come (JOHN 16:12-13); that is, until John the apostle was exiled on the isle of Patmos (I believe the LORD hinted at this when Peter asked what would become of John (JOHN 21:21-23); and we know that John did tarry until the LORD came to him on Patmos and delivered this revelation!). Now we will deal with this phrase found in verse 1: “which must shortly (Greek words: en and tachos) come to pass”. Mockers and naysayers love to point to this verse and ridicule the idea of the LORD’s return, stating that it’s been two thousand years and still nothing! What did He mean by “shortly”?? The conjunction of these two Greek words places an emphasis on something that will happen quickly, suddenly, with haste, but with a fixed position or directive, that is, something that will occur suddenly, with nothing able to prevent it. This carries the same idea as the coming of the LORD Himself (REV 22:7,12,20; see also MATT 24:27 where the manner of His coming is compared with lightning, which comes in a flash of incredible speed). “These things” pertains to everything that our LORD addresses, starting with His visitation in Chapter One, the chronicling of the churches, beginning with that particular apostolic era that is contemporary to John and running through to the seventh and last church, representing the Laodicean age of apostasy that is contemporary to us in the 21st century. Then “the things which shall be hereafter” or the next stage of history once the church age is completed. We will get into the details of all of this as we progress through this study. The LORD “signified” these things by His angel to His servant John. That is, by these various signs or visions as seen by the apostle, indicate future events that would transpire, both in the near and distant future; all of which revolves around the central theme of Revelation (and the Scriptures as a whole): Redemption! Here is the blessing promised for all who will hear what this book proclaims, keeping the truth contained here, for we have available to the church as well as saints in the days ahead such promises and encouragement that will avail us in the times ahead. For John the apostle, the time was at hand, because written in this book are admonishments for the churches of Asia Minor (modern day Turkey). For us who live in Christ today, the time is at hand in two capacities: in the coming of Laodicean apostasy, but also the coming of the LORD as we see the signs clarifying in their nearness, the crucial sign of last days having already appeared: the regathering of the nation of Israel (ISAIAH 11:11). For the saints who will encounter the final, 70th week of Daniel, these things will be “at hand” and they will also be blessed in reading this book for it shall provide them the most profound hope in the face of abject despair: at the supreme rule and reign of darkness and the anti-Christ. These seven churches are examined in Chapters 2 and 3. They were actual churches located in what is known today as Turkey – in those former days, as Asia Minor, a province in the Roman Empire. These fellowships, seven in number, represented more than just the actual churches located in this Roman province – they were ‘types’ or ‘classifications’ of church fellowships; in other words, every church you might visit has the characteristics of one (or more) of these seven – thus the admonition that these letters be read by all the churches (among these seven, but also every church). These seven letters could also describe individual Christians and be used as ‘spiritual barometers’ for either church or church member. As startling as it may be, these churches, in the order that they are presented also seem to trace the history of the church, beginning with the apostolic age and ending with the age of apostasy, represented by Laodicea. We will get into these details and more once we arrive at Chapters 2 and 3. The typical greeting that we normally see in Paul’s epistles is seen here “Grace. . . and peace”. The latter is impossible to experience without the former, and both are granted to the Christian as a matter of birth right into the kingdom of God. In as much as the Christian has access to this grace (HEB 4:16) they may experience the peace of God (PHIL 4:7-9) because by the grace of God, they have peace with God (ROM 5:1) through the LORD Jesus Christ. This world, increasing in tumultuous troubles and trials, is yearning for peace and is finding poor substitute in drugs, sexual promiscuity, religion, eastern meditation techniques, etc. Yet the only genuine peace is when one is united in relationship with their Creator, just as He intended – but was broken due to the entrance of sin into the world. This relationship is reestablished by the wondrous and holy cross, where Christ – the Bridge of Redemption that spans the unsurpassable gap between depraved sinners and the Holy God of creation. The offer of salvation, from sin, death and hell is freely given by the grace (unmerited favor) of God, through Christ Jesus our LORD (ROM 4:1-9,16). His answer was simple: “Because I love you Jim.” And that was it – in flowing tears, I surrendered my life to the LORD right then and there without reservation or doubts. This is my testimony. This benediction of grace and peace ultimately comes from the Eternal One, He “Who inhabits eternity” (ISAIAH 57:15) – or as it’s expressed in our text here, “him which is, and which was, and which is to come”. Just as God the Son left eternity in the habitation of heaven and stepped into time at His birth in Bethlehem 2,000 years ago, He will once again walk through the door of eternity and step into our time domain – to reign and rule as the Lion of the Tribe of Judah! 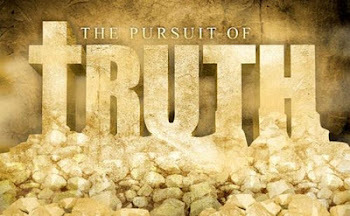 He will reign in absolute truth, justice, grace and peace empowered by seven Spirits of God. You may find that statement confusing, as we have all been taught about the trinity – the Three Persons of the Father, Son and Holy Spirit comprising the Godhead (1 JOHN 5:7): so, what is this about, “the seven Spirits of God”? Refer back to the quote we made earlier from ISAIAH 11:1-3; there it lists the attributes of the anointing upon the Messiah – count how many there are beginning with “the spirit of the LORD” in verse two. There are seven there! The Holy Spirit Who is called “another Comforter” in JOHN 14:16 comes from the Greek word paraclete or the many folded. I suppose those folds number seven, just as with ISAIAH 11. Note in vs. 6 where it states that these saints are made “kings and priests” – this tells us that these saints are not of Israel; for they always kept the royal and priestly lines mutually exclusive; kings only came from the tribe of Judah, priests only from Levi. There are only three in the Bible that were both kings and priests: Melchizedek (a type of Christ), Christ Himself, and the church of Jesus Christ, washed clean from sin by His blood (1 PET 2:9). The word here for “witness” is martos in the Greek; as you can probably guess, it’s the word that we get ‘martyr’ from and this is most telling: to be such a witness, a faithful witness, that one could be threatened with death or even slain yet remain steadfast in allegiance to the LORD and the truth of His Word!! Yet the LORD is also the faithful witness of the Father, saying only the same things that the Father says, and does only that which pleases the Father (JOHN 5:19,30) and a faithful witness of Who the Father is (JOHN 14:7,9). And we who follow the LORD Jesus, and yield to His glorious work in us by the Holy Spirit are likewise enabled to be faithful witnesses, such as Antipas, who we will learn about in REV 2:13.
rapture of all those who comprise the church (which is typified in the feast of Pentecost (or the “Feast of Weeks”), about 50 days after the Feast of Firstfruits), when the Father bids His Son to go get His bride and delivers us from this present darkness. For more on this, check out this article by GOT QUESTIONS. This speaks of the Second Coming of the LORD Jesus Christ. When adjured by the high priest in Jerusalem whether He was the Christ, the Son of God, the LORD responded that he would “see the Son of man sitting on the right hand of power and coming in the clouds of heaven” (MATT 26:63-64). It is at this time that every eye will see Him – remarkably enough even those who pierced Him (those Roman soldiers)! Preterists who believe Christ came the second time already in 70 AD would point to such verses as this, stating that Christ had to have come within the generations time that saw Him crucified in order for those who “pierced Him” to see Him during their life time (or the high priest for that matter, referred to in MATT 26). Yet this verse in our text states that “every eye shall see Him” and that “all the kindreds of the Earth shall wail because of Him”. This certainly didn’t happen in 70 A.D. – at least not so you’d notice! It’s only possible that when the LORD returns that “all kindreds” – people from all over the world, when every eye shall see Him – this has yet to occur, but it will at the Second Advent. And much later, at the Great White Throne Judgment, there shall be even more wailing when they realize that the One Who was pierced, the One that they have ignored all of their lives, though with bloodstained hands He offered an invitation to His kingdom, is the One Who is their Almighty Judge! Again, we see Him declared as the Alpha and Omega – that is, the Beginning and the End, or the First and the Last (ISAIAH 41:4; 44:6; 48:12; REV 1:11,17; 2:8; 22:13); He is the Eternity Dweller Who sees all times and places simultaneously, and is readily able to prophesy and speak of the future as easily as the past – something that the false gods could never do, even at the taunts of the Almighty! See ISAIAH 41:22-24. The humble apostle, probably the last living person to have ever seen the LORD in the flesh, refers to himself as “your brother” and “companion in tribulation” as well as “in the kingdom and patience of Jesus Christ” that is, a fellow citizen of the kingdom, awaiting patiently the coming King. Church history according to Tertullian in The Prescription of Heretics, tells us that this last apostle was cast into boiling oil as a result of his faithful witness of Christ, but he suffered no ill effects at all from it, to the astonishment of the on-lookers; it is said that mass conversion to Christianity happened as a result of this miracle. The Word of God which brings light to the lost will always be an offense to lovers of darkness that conceals the evil condition of their own hearts (JOHN 3:19). John was faithful to the prophecy of the testimony of Jesus Christ (REV 19:10) and so, this bearer of the Light, John the apostle, since he couldn’t be martyred, was exiled to Patmos – essentially his opponents put a bushel over him in an attempt to hide that light (MATT 5:15). The LORD’s day here could refer to what John saw “in the Spirit” in reference to “the day of the LORD” (a prophetic time period in the last days that involves God’s direct involvement in the judging of nations) or it could simply be that the apostle was telling us that this vision he saw happened on Sunday, which customarily came to be known as ‘the LORD’s day’ as it was the first day of the week (Sunday) that the LORD rose from the dead with resurrection power (JOHN 20:1-14)! The Alpha and Omega here lists the churches that John was to send these letters to, and they are addressed in precisely the order as listed above, beginning with Ephesus and ending with Laodicea. We need not guess what these lampstands are: they are the churches (vs. 20). We see that the Son of man, God made flesh (JOHN 1:14) is walking in the midst of the churches, just as He is in the midst of those gathered together in His name (MATT 18:20). Let us be mindful of the next time we see these lampstands, what the text refers to them as, and their location! He is clothed with a golden girdle as the great High Priest, but His is gold, denoting Deity. Hoary heads are an indication of wisdom – “a crown of glory” and as He is Himself wisdom, His hair is pure white as is His head – a purity of Mind beyond anything humanly conceivable. His eyes are a flame of fire – and fire purifies, discerns, judges what a substance may be. His eyes discern and perceives all things; there is nothing hid from His sight (HEB 4:13). His feet are like fine brass – and brass is also associated with judgment: “the grapes of wrath” are His to trample (REV 14:17-19; ISAIAH 63:2-4). His voice is the sound of many waters – for from His mouth issues the Word of God, seen as a cleansing, purifying influence like water (EPH 5:25-27). The seven stars are the angels of the churches (vs. 20); we typically think of angels as spiritual beings who serve God in heaven, and the saints on Earth, and that they are. The actual meaning of angels however is “messenger” and this is something angels do: they are messengers of God sent to us to deliver the word of the LORD! Yet we may also cast pastors in such a light: they too are messengers, sent to the church as God’s gifts to equip and edify the body of Christ (EPH 4:11-12). These are in the hand of the LORD, and thus are motivated and led by the Bishop and Shepherd of our souls. The spoken word of Christ is the power of God, for He spoke and creation came to be. 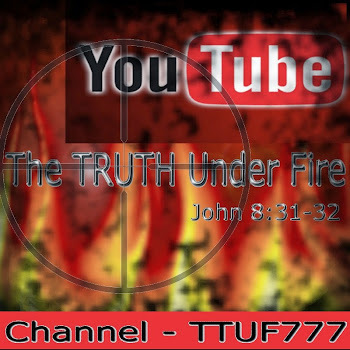 His word is indeed the Sword of the Spirit (EPH 6:17), and we have the transcript – which is the Holy Bible! From His mouth, we also see an iron rod (REV 19:15) which speaks of correction, judgment and strength, which He will render as the Holy Judge of all the world. The glory of His countenance is beyond our ability to comprehend, any more than our eyes can comprehend the sun for all of its brilliance. Yet there is coming a blessed day when we shall be able to gaze lovingly, without flinching, into the very glory of His face! In verse 18 the LORD Jesus testifies that He was once dead, but alive from the dead for eternity, death having no more dominion over Him, once He rose from that garden tomb in Jerusalem (ROM 6:9-10)! Because the LORD says “fear not”, we therefore have no need to fear death or anything else for that matter – because JESUS has risen from the dead, having vanquished sin, the grave, and all the power of the enemy! He holds the keys (the authority) of hell and death! “Hereafter” appears here, and it means that which comes after something else; it represents closure of the former, and something new or different forthcoming. We see this word elsewhere (REV 4:1 and REV 9:12).